From the time she was cutting out paper dolls as a kid, Norma Lu Meehan knew her life was to be connected in some way to the drawing of pretty clothes. After taking two years of costume design and fashion illustration from Lois Marshall in South Bend, Indiana, it was off to New York to the Parsons School of Design. Taking anatomy and life classes, and painting the historic gowns in the Brooklyn Museum laid the foundation for what Norma Lu would be doing the rest of her life. Returning home to South Bend, she began a long career as a fashion illustrator. Her primary clients included The Frances Shop and The Milady Shop ( fine specialty shops), Mr. Leonard Furs and Gilbert’s Men’s store, said to be the largest menswear advertiser in the country. A favorite client was the Dainty Maid Bake Shop because Norma Lu and her family got to eat every special of the week that she drew. Outside of South Bend, she did the advertising for John T. Shayne on Michigan Avenue in Chicago. After working for decades as a fashion illustrator and art director, Norma Lu turned her creative efforts to paper dolls. Her specialty is antique clothing and it shows in her paper doll art. Her Wardrobe series, published by Hobby House Press, includes paper doll sets from the Edwardian, Victorian and Art Deco periods. Her Colonial series paper dolls have been published in Contemporary Doll Collector and Miniature Collector magazines. In more recent years, she illustrated several historic costume paper doll books for Texas Tech University Press. Two books, Collection by Design I and II, represent dozens of exquisitely rendered costumes from the Kent State Museum collection. Other titles include The Fowler Family Gets Dressed, The Fowler Family Celebrates Statehood and a Wedding, and Heroine of the Limberlost about naturalist and author, Gene Stratton-Porter. Another specialty of Norma Lu’s is creating custom paper dolls for individuals. Many families have been elated to see a loved one and their wardrobe appear as a beautiful paper doll. 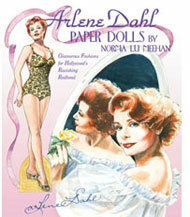 Today Norma Lu enjoys transforming favorite movie stars into paper dolls including Greta Garbo, Rhonda Fleming, Arlene Dahl and Margaret O’Brien. Other fashionable titles include A Palette of Paper Dolls and Little Ladies of Fashion. With a big family of children and grandchildren, Norma Lu divides her time between her home in Indiana and her lake house in Michigan.